It’s always really hard for me when I spend hours and hours on a recipe and it ends up poorly. It might sound like I’m overstating my sorrow but it is such a disappointment when all my hard work comes to naught. Especially when I am hoping to have a recipe worthy of an epic blog post… and all those ingredients! Sigh. So let me tell you the story of this failed sachertorte. I took it upon myself to make a sachertorte, because, it’s just a chocolate cake, right? Wrong. It’s not just a chocolate cake. 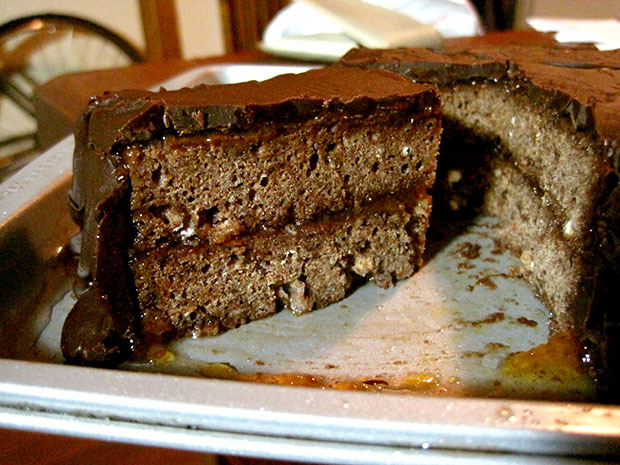 It’s a chocolate cake that has been embroiled in a legal battle and it’s really hard to make. 1. Not having an electric mixer when trying to beat egg whites to stiff peaks is really hard. I hand-whisked the egg whites for at least 20 minutes, and although they at least tripled in volume, they never achieved the consistency of stiff peaks they were supposed to. This subsequently probably resulted in the dense and dry texture of the cake, which had no other leavening apart from the egg whites. 2. The chocolate glaze recipe was one for this Boston cream pie, because I didn’t have heavy cream and I didn’t want to go out to get some. The glaze ended up more like a solid chocolate chunk that shattered as I cut into it after refrigeration. The glaze, if you’re to use this recipe, should probably be applied immediately before serving. 3. I really should have sifted the flour before baking it, because it resulted in flour pockets in the final result. I didn’t own a sieve, but now I do. If you are curious, this is the recipe I used. It’s too bad the cake I made wasn’t so good, because I even used Austrian 80-proof Stroh rum for the apricot jam glaze. Sigh. I am sad.